Please give us 3-5 calendar days to embroider the stockings - or less! We have the stockings already made in stock and just embroider them, so they will reach you within days of your order if you are in USA. Take a look at the images of the group, they look nice together - the different sizes give them that homespun but modern look. 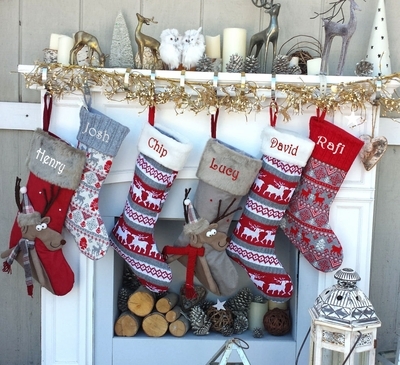 COLORS: The long 22" knit Reindeer stocking has BRIGHT white in it, the long 22" Ivory Red Intarsia Knit's whites are more IVORY than white, compared to the small 18" knit stockings which have more off-off white in them. The color scheme is the very popular and trendy RED WHITE AND GREY. The 18" Reindeer knit stockings are Knit Front, kinda like Nordic Intarsia knit sweater and Felt back. No lining inside. The 22" Knit stockings with Reindeer and Intarsia patters are knit on front and back. The inside has sort of a lining - a webbing - to stabilize the knit. These are sewn from knit fabric so on these stocking the knit pattern may not line up exactly at the side seams. YOU CAN ORDER BLANK STOCKINGS FOR FUTURE CHILDREN AND WE WILL BE HAPPY TO EMBROIDER THEM IN FUTURE YEARS FREE OF CHARGE, YOU'D JUST PAY FOR THE SHIPPING. The Felt 3D Reindeers with red and grey boot are available on another listing.